I’ve been purposefully avoiding Adam Sandler comedies and unintentionally not watching Adam Sandler movies. Is that confusing? Let me clarify. While realizing I’ve outgrown the stagnant man-child comedies he’s churned out under his Happy Madison productions for years now, I’m fully aware he has a baffling fanbase that will consume anything from his production house (even the “Paul Blart” comedies), but I’ve been content dismissing his dire and insulting humor. I also haven’t gotten around to Sandler’s more dramatic turns, but from what I heard I haven’t missed out on much (that guy from “Punch Drunk Love” has to be in there somewhere!). 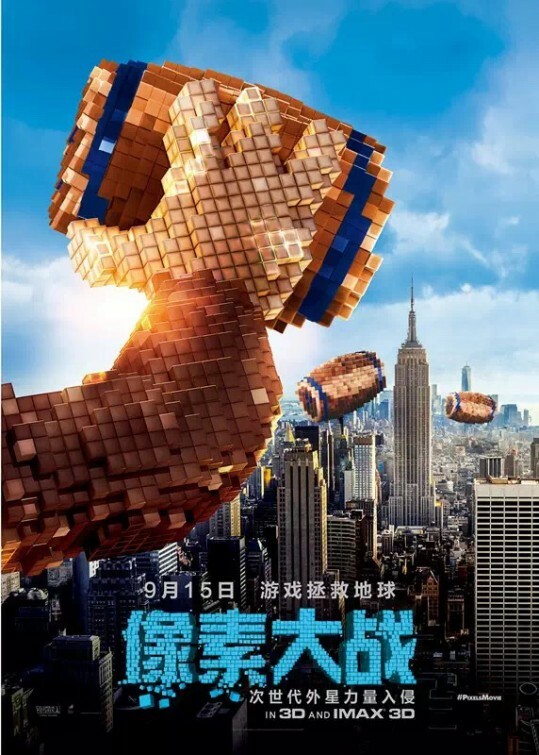 So, how is it I found myself checking out “Pixels”, the latest from the Happy Madison assembly line? I suppose the personal draw here comes from the Child of the 80‘s vibe the movie has going for it, but then again Sandler is always using 80’s references in his movies – especially in his soundtracks. To be more specific, I knew the movie was focusing on guys over forty, who spent loads of time (and quarters) at the arcade back in the day. For a change, that’s something I could relate to in an Adam Sandler comedy. The movie opens in 1982, booming with a classic rock soundtrack, a Sandler comedy staple. We’re introduced to child actors who are obviously supposed to be younger versions of Sandler, Kevin James, Josh Gad and Peter Dinklage. The resemblances to the actors is uncanny and seeing these kids get consumed by arcade games elicits the kind of nostalgia the movie is going for. This is back when you had to leave your house to play, when there was nary a handheld device to be found. The arcade was the place to meet other kids, bask in the glory of high scores and witness players anticipate game patterns and strategies for games like Pac-Man, Galaga, Defender, Centipede, Q*bert, Asteriods and Donkey Kong – and watch them become champions or become one yourself. Back in the day, Sam Brenner (Sandler) had an incredibly natural gift at mastering games. In fact, he became a reigning champ until he was beaten by cocky Eddie “The Firebreather” Plant (Dinklage) at a championship competition (hosted by none other than Dan Aykroyd). The whole event was recorded by NASA and shot out into a space capsule with other pop culture nuggets in an effort to let any extraterrestrial life forms know what the people of Earth are like in 1982. Decades later, that defeat turned Brenner into a sad sack of an adult, installing home technology (think Geek Squad), while his best friend, Will Cooper (James), went on to become President of the United States. That’s right. 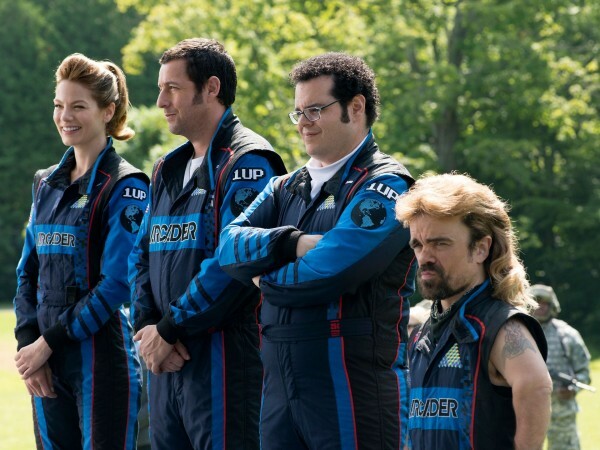 You can stop right there and let it sink in that “Pixels” has Kevin James as a low-rated POTUS. If you haven’t already figured it out, that’ll tell you how serious you should take this movie as well as how funny it could be (depending on your sense of humor and whether or not screenwriters Tim Herlihy and Timothy Dowling actually deliver jokes that land). Too bad Jane Krakowski as the First Lady barely gets any lines in. No surprise since this is primarily a bro fantasy flick. What happens next has been shown in the trailers that have been playing ad naseum for months now. Earth is invaded by hostile aliens that take the form of classic arcade game characters and director Chris Columbus (“Home Alone” and the first two “Harry Potter” movies) employs some colorful CGI that convincingly transforms 8-bit to organic voxeled forms. It turns out they believed that capsule with video footage of arcade players was a call to war and now they’ve made their first move (dunno why it took them 30 years) by having Galaga attack a U.S. military base in Guam. But that’s just the first attack. Realizing the world is being invaded by arcade games, the President calls Brenner, the only guy he knows who can find a way to beat the space invaders. Of course, this idea is scoffed at by White House military strategist (another military role for Brian Cox) and weapons designer, Lieutenant Colonel Violet van Patten (Michelle Monaghan), whom Brenner recently installed a flat screen for – far from coincidental since Sandler has to have a gal to flirt with. Joined by conspiracy theory nut, Ludlow (Gad), another childhood geek and paroled nemesis Plant (obvious characterized after real-life Donkey Kong champ, Billy Mitchell – see the great documentary “King of Kong: A Fistful of Quarters”), the team is named “Arcaders” and are sent to Paris to tackle Centipede and then on to New York City to play Pac-Man. 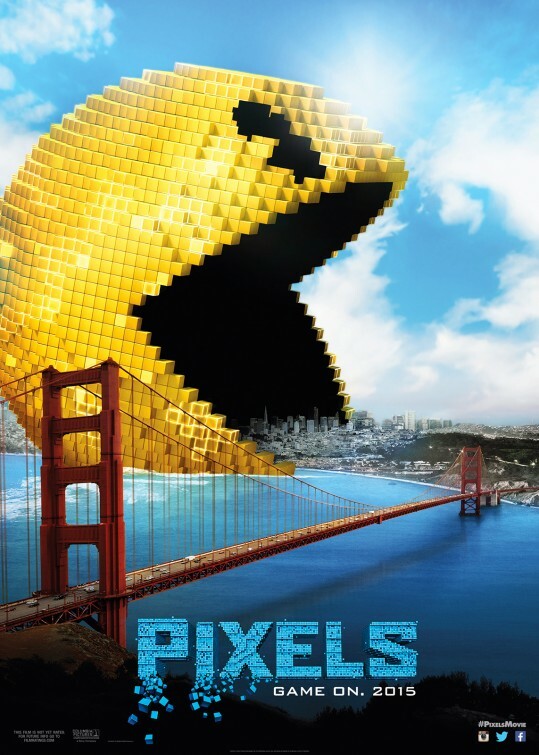 “Pixels” offers some laugh-out-loud moments, but those laughs come from seeing things like a giant Frogger attack citizens, flying Joust ostriches and Arkanoid destroying the Taj Mahal, instead of providing humorous material that surprises. The movie is entertaining solely for it’s visuals and hilarious situations, but unsurprisingly falls flat when it comes to characters. It’s not all Sandler’s fault though since it feels like he almost steps out-of-the-way for the whiz-bang visuals and to allow other actors like a game Dinklage to shine. The scene where Dinklage’s Plant negotiates his pardon out of prison is a standout scene. Between his manicured mullet and his obsession with Serena Williams (who stars as herself), Dinklage’s performance earned the most laughs out of me. However, Gad also received a tone of laughs from the audience at my screening – which I just don’t get. Initially, he had an unsettling sweetness about him, but between his lusting over a video game warrior Lady Lisa (a thankless role for Amber Benson), from the fictional game, Dojo Quest and his annoying outbursts, Gad just came across as trying way too hard. But really, what do we expect from the House of Sandler? If you allow it, you can surprisingly have a good time watching “Pixels” – that is, whenever a blasé Sandler and abrasive Gad are off-screen and the story is locked in battle mode. It’ll get blasted by critics like any Sandler comedy. That’s a given, but there are other Sandler comedies a whole lot worse. If anything, it’s definitely made me want to look up the 2010 short film by Patrick Jean that it’s based off of. Overall, “Pixels” was an entertaining movie to break my Adam Sandler fast, but I’m ready to go back to eliminating him from my cinematic diet altogether (unless Paul Thomas Anderson comes calling).